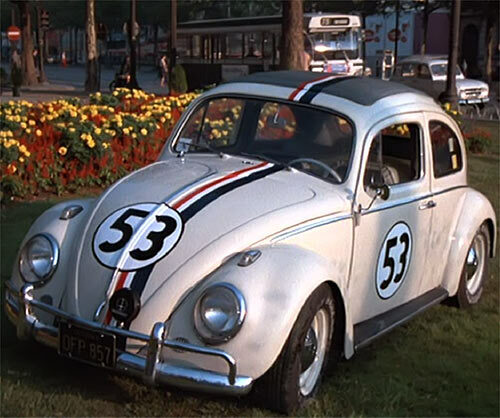 Herbie is Disney’s sentient 1963 Volkswagen Beetle (he/him) with a lot of heart. 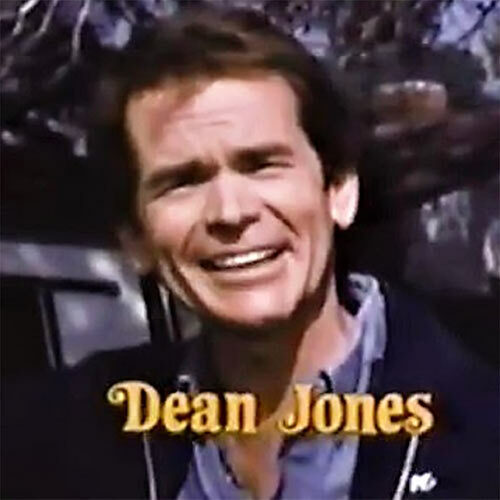 He appeared in four movies from 1968 – 1980. A 1982 TV series, sadly, lasted only five episodes. The basis for the first movie and Herbie, is the novel Car, Boy, Girl by Gordon Buford published in 1961. Writeups.org has two profiles for Herbie. The second profile covers the ’97 remake and the 2005 film. It is also the one with the RPG stats. Other Aliases: Ocho, “little car”, The Douglas car. Group Affiliation: Jim Douglas Racing team and later, Famous Driving school. Eyes: White headlamps. Hair: None. Other distinguishing features: California License Plate Number: “OFP 857”. Herbie is your everyday Volkswagen Beetle, only he’s got heart. What I mean is he has a mind of his own. All moving parts on his frame are at his command. He can swing his doors, operate his lights, windshield wipers, radio, etc. all on his own. He can even move them in ways a normal car could not. Like turning out his wheels 90 degrees to escape wheel chocks. Or tipping his driver’s seat while opening his door to jettison an unwanted driver. He’s able to squirt oil from his under-carriage, like a dog lifting its leg. Always onto the shoes of someone Herbie doesn’t like. Herbie is able to stand or drive on two wheels and hold that position. He can start and stop, hop in place, brake hard, or take off at break-neck speed! Take off and top end speeds are incredible and quite impossible for the engine setup he has. In comparison, his braking distance seems quite normal. Still, Herbie is good at judging how much distance he needs. Capable of driving as well in reverse and has a lot of experience as a race car. He even competed in off-road competition. Herbie proves to be much more durable than expected. He even survived a drop in the middle of the ocean. Later, it became necessary to learn the art of concealment in urban terrain. He’s a pretty sneaky little car. Once prominent in the field, race car driver Jim Douglas was now washed up. Jim thought to re-invigorate his racing career with a new car. Unfortunately, those at Peter Thorndyke’s dealership were too expensive. At the same time a small Volkswagen Beetle rolled into the show room. Thorndyke thought it looked too low-end and would be bad for business. Douglas took up for the little car. As a result, the little car followed Jim home. To avoid an accusation of theft, Douglas agreed to buy the car. When some hippies in a roadster challenged him at a red light, Douglas found himself in an out of control drag race. The little car’s speed was astounding. Oddly enough, Jim had his race car. I’m on a mountain in Tibet. Contemplating, right?.. Jim’s race crew worked out of his home, an old firehouse. Tennessee Steinmetz, a friend to Jim and welder by trade, was the first to realize the little car was special. It possessed a soul and a mind of its own. He dubbed the car Herbie after his Uncle Herb. Jim’s new girlfriend Carole Bennet, a mechanic, also joined his crew. Herbie raced as a Class D special. He competed against Corvettes, Ferraris, Lamborghinis, and the like. Jim and Tennessee were back in business. They began winning race after race – humiliating Thorndyke, who also raced. 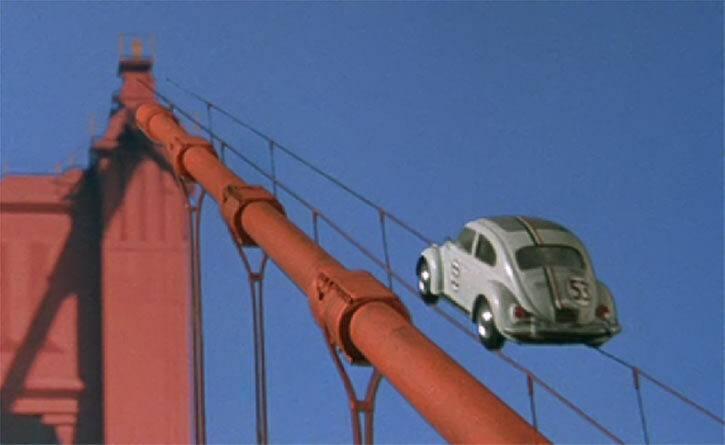 Thorndyke cheated, offered to buy the car back, and other tricks but in the end Herbie had too much heart. Herbie pushed himself hard in the final race, the El Dorado in Yosemite Valley. He ended up splitting in two. As a result Herbie took both first and third places! After the El Dorado, Herbie was back to show room quality. Jim Douglas went off to Europe to race other cars. He left Herbie at the old firehouse with Tennessee’s elderly aunt (Helen Hayes). Alonzo A. Hawk, a rich property developer, took comedic joy in the destruction of old buildings. Especially when that meant profits for his corporation. As with most Disney villains, he didn’t care who he hurts to get those profits. Hawk was on the cusp of his most ambitious project, the world’s tallest building, Hawk Plaza. Construction stalled when Mrs. Steinmetz’s refused to sign over her beloved firehouse. Hawk sent his naive nephew, Willoughby Whitfield, to get her signature. Willoughby was unsuccessful due to the intervention of Nicole Harris. But Nicole was also evicted by Hawk. She secured living space at the firehouse to protect Mrs. Steinmetz. Furthermore, Nicole and Willoughby fell in love. Thus, she and Herbie convinced Willoughby his uncle was the real crook. Willoughby soon turned against his uncle. As a consequence, Hawk pulled out the stops. He tried harassment, stealing everything she owned, and even tried to steal her little car. This last bit did not go well for him. In the end Hawk led a huge demolition crew to tear down the firehouse. Inside, Mrs. Steinmetz stood resolute. 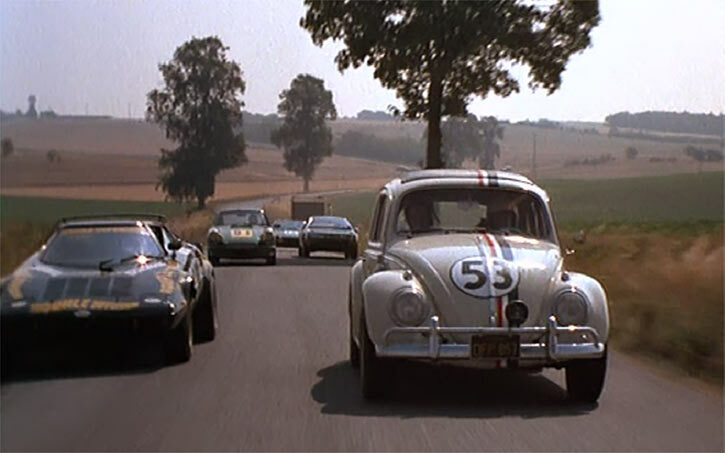 Herbie rallied every VW Beetle in the neighborhood and they all came charging to the rescue. They put Hawk and his crew on the run and saved the day. Jim Douglas had returned from his European racing tour. It had been 12 years since Herbie had raced, but Jim decided to take him to Monte Carlo for the Trans-France race exhibition. This is a grueling 500 miles/900 Km endurance race from Paris to Monte Carlo. This time he brought a new mechanic, Wheely Applegate. At the same time, the Étoile de Joie diamond was being revealed at a nearby museum. A couple of gutsy thieves stole the diamond. They made their escape but had to hide the diamond inside Herbie’s gas tank to avoid capture. The mastermind behind the heist was Inspector Bouchet. The very person assigned to investigate the missing diamond. Herbie fell instantly in love with a 1977 Lancia Montecarlo , another sentient car. The Lancia was driven by Jim Douglas’ love interest, Diane Darcy. Herbie’s bizarre antics cost both cars their initial qualifying heats. Both cars, because of their love, re-qualified by setting identical track speed records. They thus both earned the pole position. During the race there was misdirection, sabotage, and good old fashioned racing rivalry. Herbie fell behind many times but always overtook the pack again. Finally on the way to the finish and in second place. Jim noted that if the lead car made it to the tunnel first, they wouldn’t have another chance to pass before the finish. Even though they couldn’t reach the tunnel in time, Herbie had other ideas. He sped up the side of the tunnel and raced along the ceiling. Herbie outpaced the car below him, took the lead, and won the race in dramatic fashion! Afterwards, Herbie helped reveal and capture the mastermind. The diamond was then returned to its rightful owners. I’ve put the dates for each movie in chronological order to give the reader a frame of reference for when the action takes place. It’s not quite exact though. 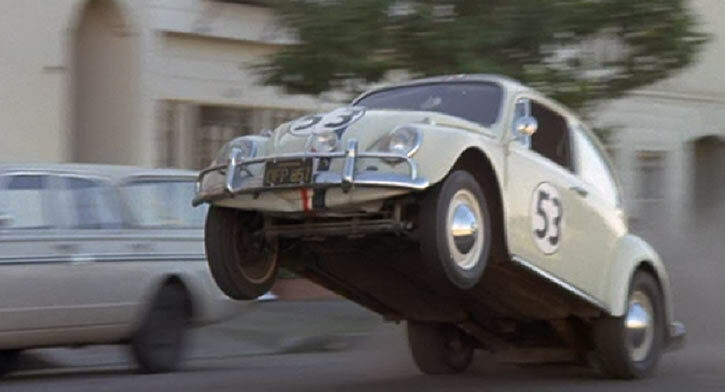 When racing in Herbie goes to Monte Carlo (1977), Jim states that Herbie hadn’t raced in 12 years. Herbie came off the production line in 1963. The first movie release was in 1968. Nine years before 1977, not 12. The Lancia Herbie fell in love with in Monte Carlo was a 1977 model, presumably the race also occurred in 1977. It’s okay, it only means the events of The Love Bug occurred before 1965. Pete Stancheck and his skeptical friend, DJ, arrived in Mexico. Pete inherited a racing car from his Uncle Jim Douglas. He was disapointed to get a 1960s Beetle where he was expecting a racing car. Herbie changed their minds by showing his speed. They decided to enter him in Brazil’s Grande Prêmio Formula One race. Herbie made friends with Paco, a young orphan turned thief. Paco called him “Ocho” (“Eight”). Meanwhile, the unscrupulous Quinn and Shepard prepared to turn over some film. On it were pictures of an undiscovered Inca gold. They intended to work with Prindle, a man with connections and means to secure the gold. But in an unexpected turn, Paco stole one of their wallets and the film with it. Meanwhile, Herbie got loaded into cargo aboard the Sun Princess. It was a ship bound for Rio, commanded by the outrageous Captain Blythe. Onboard, Pete met Melissa, a grad student, and her wealthy aunt Louise. A romance began between Pete and Melissa. As well as Aunt Louise and Captain Blythe… but nothing was genuine with either party. Herbie caused trouble below deck. As a result, he was tossed overboard on the Captain’s orders. But In an amazing show of determination, Herbie swam all the way to shore. Meanwhile, once in Panama, Paco narrowly escaped the villains. He then convinced nearby fishermen to help him pull Herbie’s rusted hulk from the waters. Escaping the bad guys, Herbie ran into a bullfighting arena. He showed off his matador skills and gave his pursuers the slip. Paco tried making money using Herbie as a taxi. This backfired when Prindle called for a taxi and the boy came to him. Prindle and his men kidnapped Paco, took the film, and used it to locate the hidden Inca gold. They tried to load some of the gold onto their plane. Herbie intervened and stopped them, smashing their plane. Afterwards, Herbie was again restored to showroom quality. Herbie was again owned by Jim Douglas. Jim was the new owner/operator of a failing business, the Famous Driving School. His sole employee was Bo Phillips. Jim supplemented his income by teaching Driver’s Ed at a local high school. Jim met a new love interest, Susan MacLane. Her fiancé Randy Bigelow became Jim’s new antagonist. Jim stole Susan’s heart and Herbie helped stop her wedding to Randy in time. Susan has three children, Julie, Matthew, and Robbie. “Uncle Randy” fronted a loan for Jim to keep himself near Susan. But this turned out to be a trick to shut down Jim’s driving school. While Herbie was away Randy had a safety inspection ordered for the vehicles at Jim’s school. As a result the loan process halted and the driving school shut down. Meanwhile Jim took Susan’s kids fishing to get to know them better. Matthew and Robbie blamed themselves when Jim and Susan had an argument. This resulted in the boys running away from home to hide out in an abandoned cabin. However, Herbie found them. In the end, a new inspection found Herbie in top shape, the DMV agreed to the loan and Jim was back in business. Jim Douglas took his new fiancée down to the racetracks. Susan met with some of his old friends and Jim met a racing rival, Sergio. Old flame Diane Darcy (from Herbie goes to Monte Carlo), was also in the neighborhood. 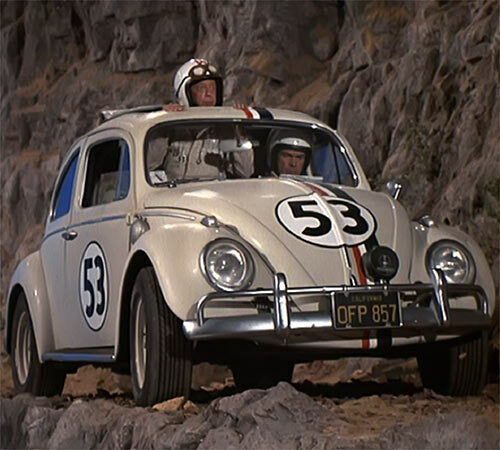 Herbie and Jim get to do some off-road racing too. Legendary Bill Bixby directed this episode – which is the only one where Herbie doesn’t cry. Bixby also directed episode #5. Randy, up to his old tricks, hired a Private Detective with surveillance equipment to gather information and discredit Jim. Randy also went to a nearby junk yard to hire the owner, known for his willingness to do illegal activities. Randy had another car painted to look exactly like Herbie. He then switched the fake with Herbie and was about to have Herbie crushed. Jim Douglas rescued the little car in the nick of time. Then, Jim and Susan wed before God and man. Growing pains marred the new Douglas home as family members get used to Jim being a permanent resident. Herbie grew jealous of the family car and began a sabotage campaign against it. Yet, this only made Susan want a new car. A bigger car. Jim and Susan test drove a new station wagon. Meanwhile, Herbie caused trouble at the car lot and got himself impounded. At school Robbie fell ill, but even the hospital couldn’t find a clear reason why. He continued to complain he needed to see Herbie. Hearing this, Herbie escaped impound. He then stealthily entered Robbie’s hospital room. Robbie was well by morning and everything returned to normal. In Herbie’s movies and TV serial, four themes are constant. First, Herbie is a race car with a chip on his shoulder. He’ll prove he’s the faster car to defend his honor. He is often presented as the underdog. Second is why he’s called “The love bug”. There is always a bit of romance and Herbie is there to assist. He likes to take over and drive the newly acquainted couple to look-out point. The lady in this part is always a head strong woman able to put their male counterparts on the run. A third element would be that Herbie always has a new friend, not necessarily his new owner. And fourth, a new nemesis or rivalry. 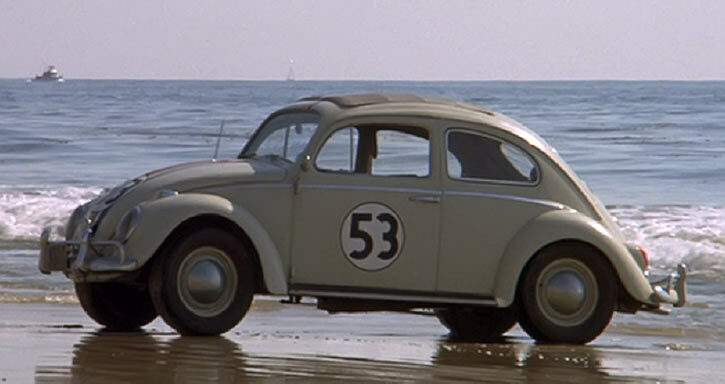 Throughout the movies and the series Herbie does little to hide that he is a sentient car. Even after seeing Herbie do things on his own. Or a new driver struggling at the wheel only to have Herbie do whatever he wants. Still, people try hard to disbelieve. Herbie, The Love Bug is a 1963 Volkswagen Beetle deluxe ragtop sedan. He’s painted in Volkswagen L87 pearl white with grey interior. According to IMDb, the interior would normally be a matching white. Herbie’s interior was instead painted a special non-reflective grey for photography. 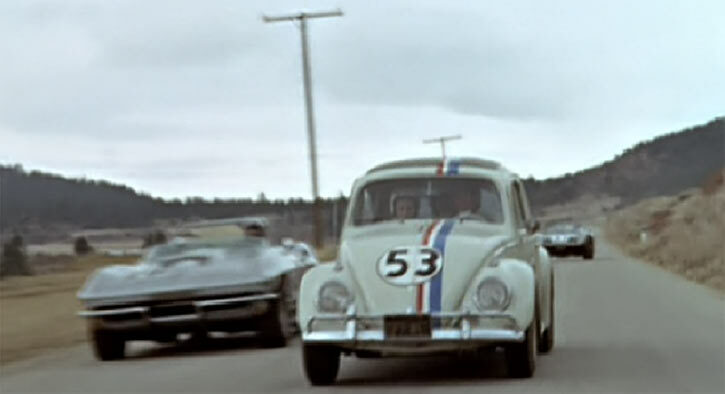 When Herbie became a race car the number 53 was chosen. 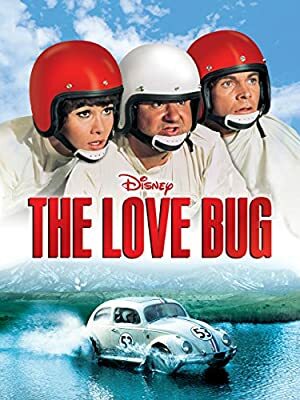 A Disney Director/Writer for The Love Bug chose the number because he was a fan of Los Angeles Dodger’s baseball player Don Drysdale – jersey number 53. The number displays on the hood, trunk, and both doors. A red, white, and blue racing stripe runs the length of his body. Herbie’s gas tank is under the hood just as it was designed in 1963. Yet, in Herbie goes to Monte Carlo the crooks hide a stolen diamond in his tank by lifting a gas cap on Herbie’s passenger side. This change to Herbie is never seen again. It was most likely done for convenience. The crooks didn’t have to get inside Herbie. It also follows American car convention with fuel tanks with caps being on the outside of vehicles. The stock 1963 Volkswagen Beetle had a manual 4-speed transmission and a 1.2 liter 4-cylinder engine with only 40 Horse Power. The speedometer was registered for 90 miles an hour. Gas mileage of 17 miles per gallon. Its tank held 9.2 gallons. So, his effective range is 326.4 miles. He is treated by his owners as a pet, as a child, and yes a friend. Herbie is quick to take offense when disrespected. He has tenacity but mellowed a lot by the time Douglas had opened his driving school. Herbie is protective of innocent people, but his instinct is to run. Since he can outrun most any pursuer. I’m not saying Herbie won’t fight! Once he’s angered, he’ll charge the one he’s angry with. Look at Mr. Thorndyke from The Love Bug. He takes dogs for rides for fun. While Nicole and Willoughby sat on the beach and talked. Herbie drove around chasing seagulls. Sometimes Herbie is jealous of other cars. He reacts to reprimand like a child. “Herbie, if you don’t stop this I’ll make a call to that used car salesman down the road”. He’s prone to pouting and later crying. His entire chassis shakes when frightened. This profile is continued in the second half! 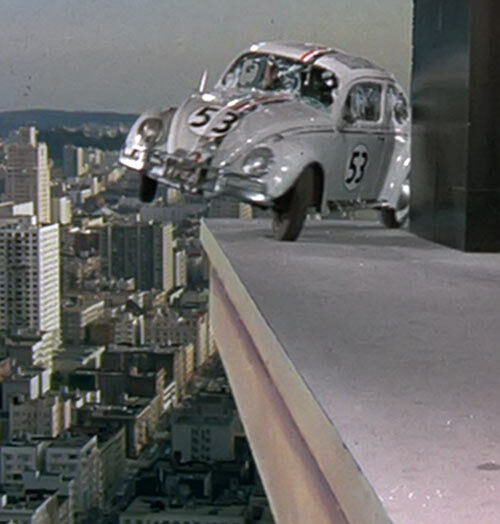 Source of Character: The 1968 movie The Love Bug, 1974 Herbie Rides Again, 1977 Herbie Goes to Monte Carlo, and the 1980 Herbie Goes Bananas, the 1982 TV series Herbie, the love bug, The That Lovable Bug documentary on the making of the 1968 film. Helper(s): IMBd.com , disney.wikia.com . Writeup completed on the 11th of September, 2018. To me the first movie is the best. Others have some high points but it’s hard to beat the original.